Did you do this in grade school? You should do it again. 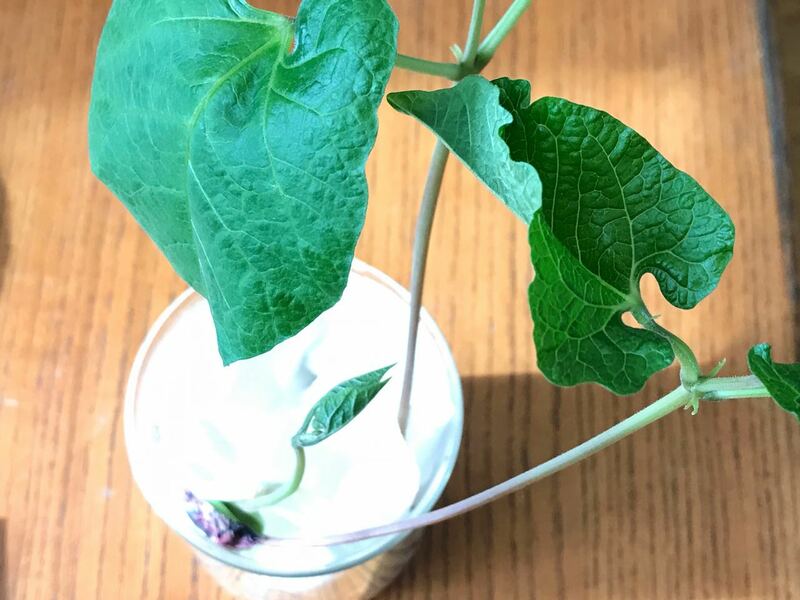 Watching beans grow inside a jar is like Jack and the Beanstalk meets x-ray vision. I did it recently to get pictures for a Gardening with Children Master Gardener presentation I was writing. 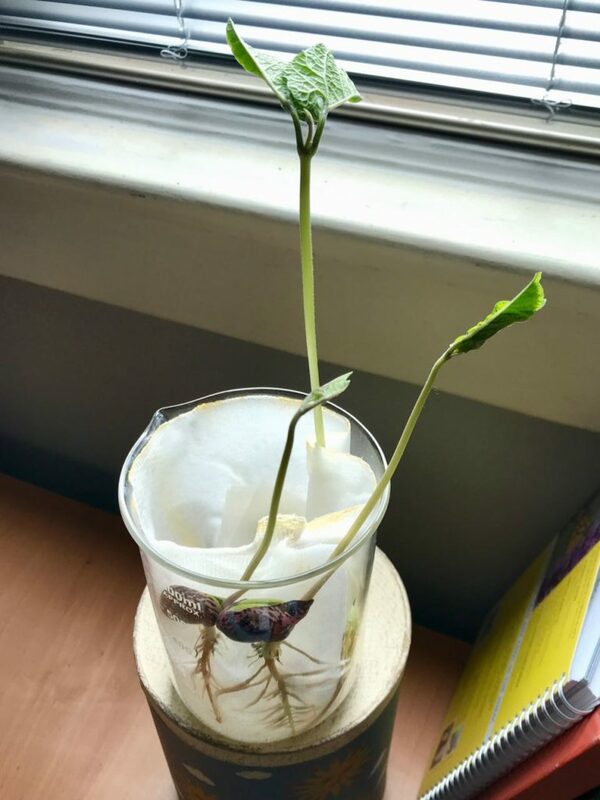 But with the beans growing right beside me on my desk, I could not stop obsessing over roots and shoots and roots again! 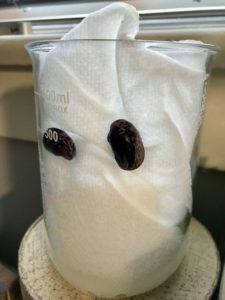 And so began my geeky, grownup fascination with the bean seed experiment. Feb. 6: The beans went in. 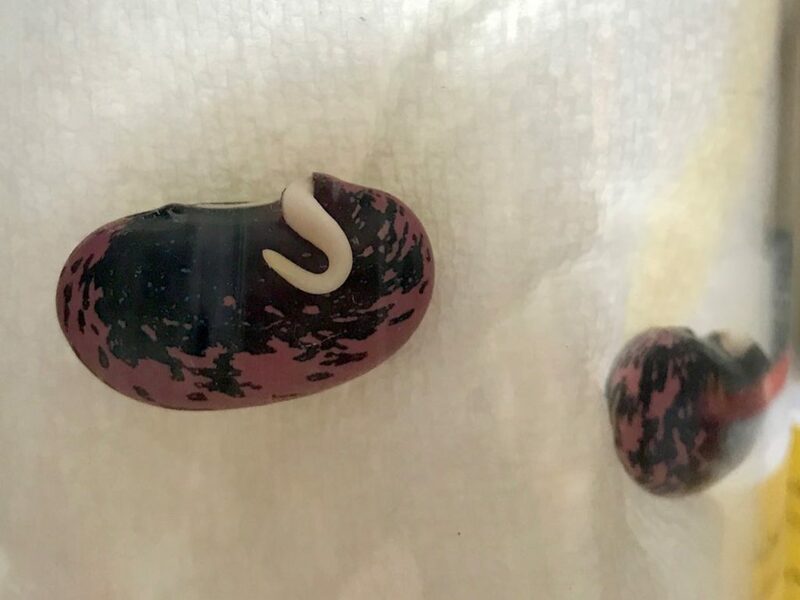 Seeds from last year’s scarlet runner beans (Phaseolus coccineus) were the subjects. The stage was an old lab jar lined with moist paper towels, with a crumpled paper towel in the bottom to wick up moisture. The seeds went in, some upside-down and some sideways, between the paper towel and glass roughly half way down the jar. 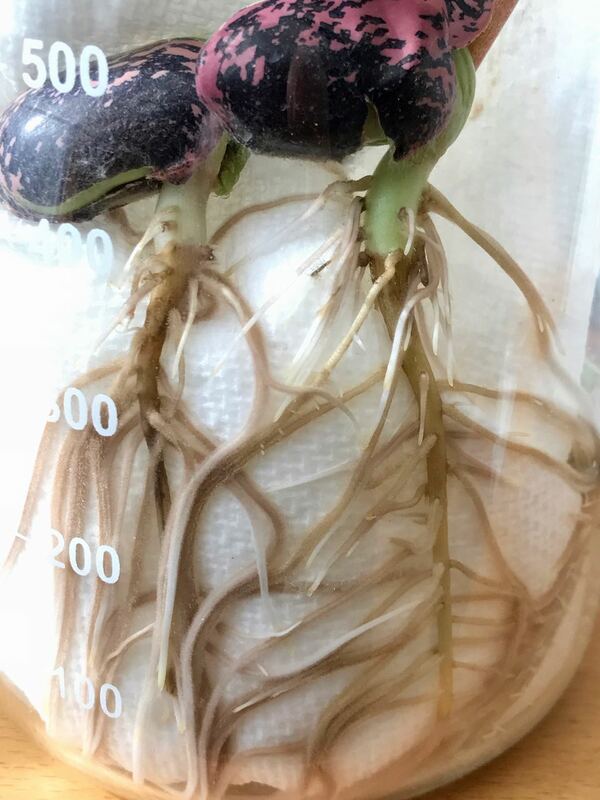 In hindsight, they could’ve been higher to make room for the roots, but half way held these large beans in place. 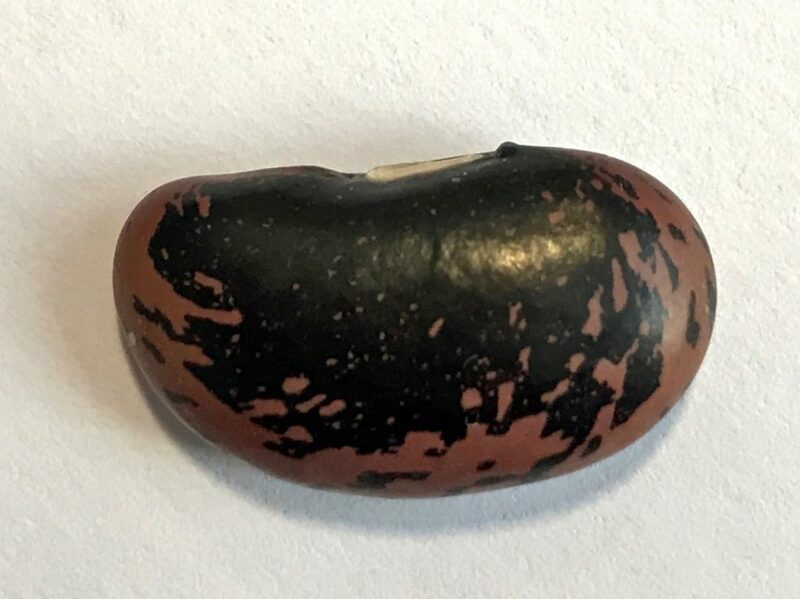 Have you ever paid close attention to a bean seed? I mean, it’s a bean, after all. What could be simpler? A balloon-like oval with a belly button. Well, after countless beans planted over a lifetime, my eyes have been freshly opened. Run your finger along the top of a large bean like the runner bean. Feel that bump on the right? Confess. Have you paid much attention to that itty-bitty, pimple-like bump, called the hydropyle? I hadn’t. 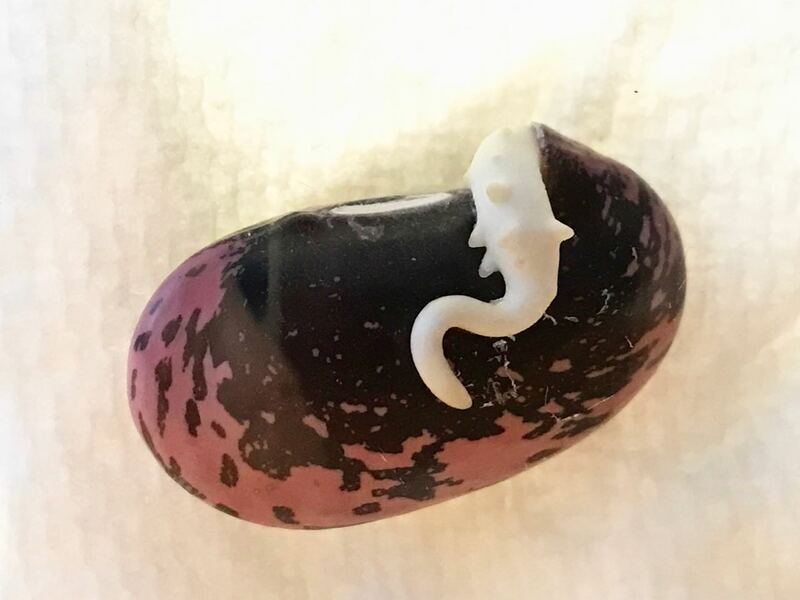 Right there beside the “bellybutton” (or hilum), which marks were the bean was attached to the pod, it’s more important than its insignificant appearance suggests. At fertilization, the hydropyle is where pollen would have entered the ovary. At germination, aka when the bean sprouts, it’s where water enters the seed to trigger the growth process. All of this piqued my need to find out as I noticed where the roots always appeared first. That tiny hole must also make a convenient break in the tough bean skin, perfect for the tiny emerging root to escape. Feb. 12: See the early root emerging from the hydropyle? At this point in its life, the root is very smooth. Feb. 14: No matter which way up the bean was planted, the roots always found their way downward. The idea that a plant’s roots respond to gravity was introduced to me in Daniel Chamovitz’s excellent book What a Plant Knows. Find it. Read it. It’s short (less than 140 pages), science-y, and full of wonderful, easy-to-understand info. This article from NPR.org gives the nutshell details of gravitropism in roots. Yes, lots of good Scrabble and crossword words in this post. Feb. 25: One of the beans puts out a shoot. Once the bean gets going, things move along quickly. About 10 days after the first questing roots appear, growth has advanced significantly, up and down. Feb. 25: Root systems start to diversify. You can clearly see the root caps, like glowing points of light on the shorter roots. The longer roots are putting out root hairs. The most fascinating aspect for me was the part we don’t usually see: the roots. The root caps that act as armour allowing tiny roots to drill through the soil were highly visible. Behind the caps are the areas of active cell division (meristematic cells) that cause the roots to elongate. Also near the tips are the weighty cells you saw in that link earlier that respond to gravitational forces and sending the roots downward. If you look closely, you can also see a little fungal growth happening in one dark area. I also wondered if the round blob on the left near the top of the tap root might have been a root node created to fix nitrogen. 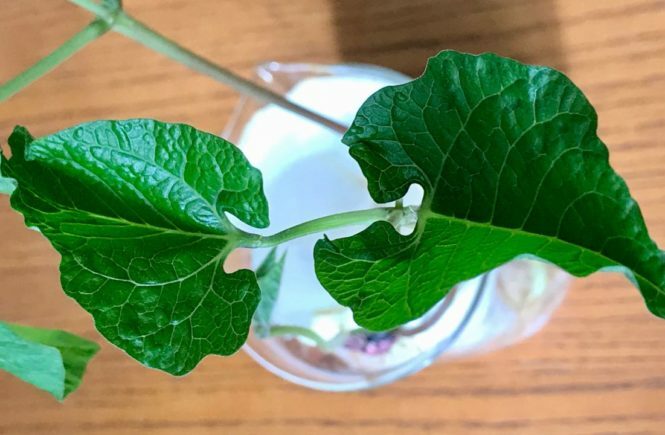 Members of the legume family, such as beans and peas, do this in collaboration with soil microbes. But on further research into the nitrogen-fixing process (recommended reading for soil and plant fanatics like me), I concluded: it’s just a round blob. Feb. 22: Emerging stems, reaching for the light. 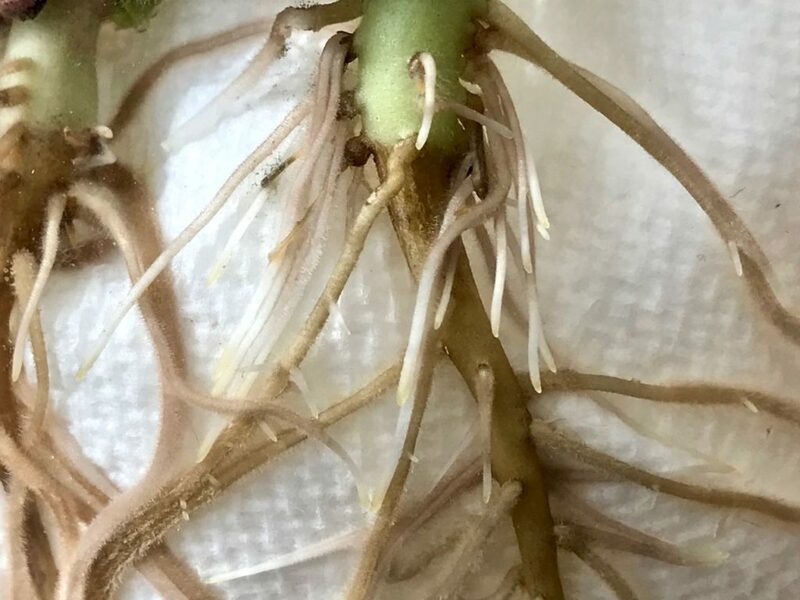 Feb. 25: See the initial tap root, now with a system of lateral roots. Cursor over the smaller images to read the captions, or click any image for a slide show (unfortunately, without captions). My little friends lived beside me in my office for the better part of a month. I became very attached. As you’ve strolled through this with me, rather than thinking I have too much time on my hands, I hope you’ve thought of it as taking a few minutes for horticultural mindfulness over the course of three weeks or so. 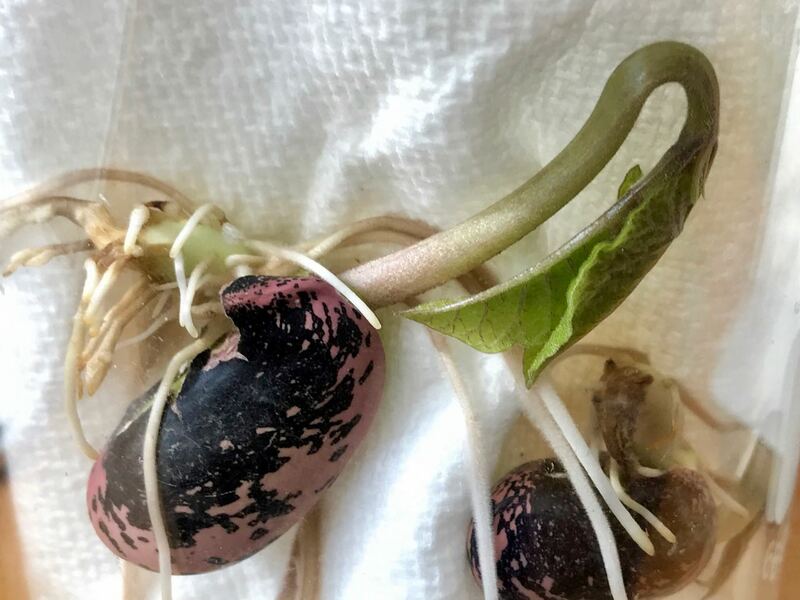 Feb. 25: The cotyledons (the meat of a bean) provide food for the growing bean and shrink as the stored energy is used up. At a certain point, however, I knew it would be time for us to part. 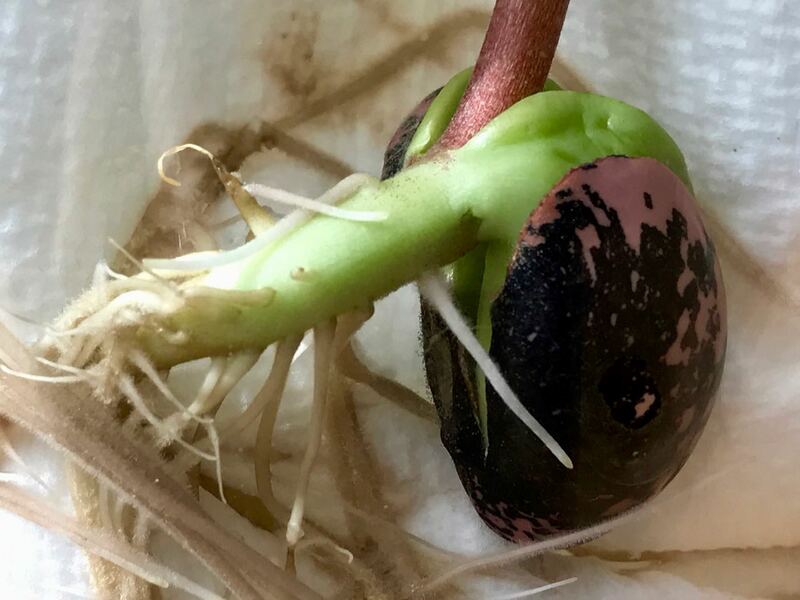 As beans don’t transplant well once the roots develop (though you can pre-sprout them to speed up germination before planting) and as it was February – and February 2019 in Toronto – they had to meet their end in the compost. Thank you, little beans, for educating me so well! 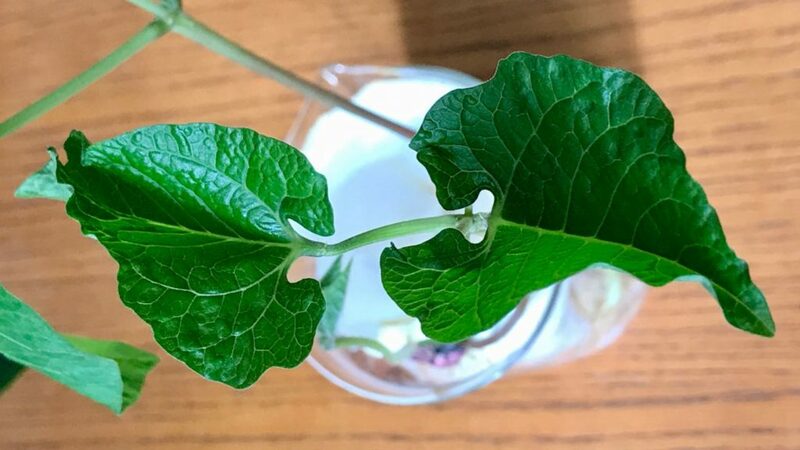 Feb. 25: Primary leaves are growing quickly. 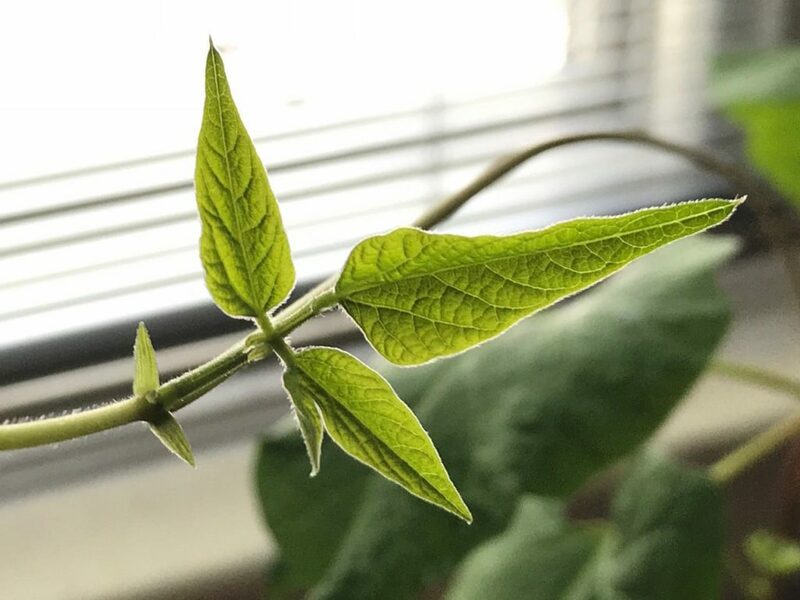 Feb. 28: A little over three weeks after planting, 3-part secondary leaves begin to appear. 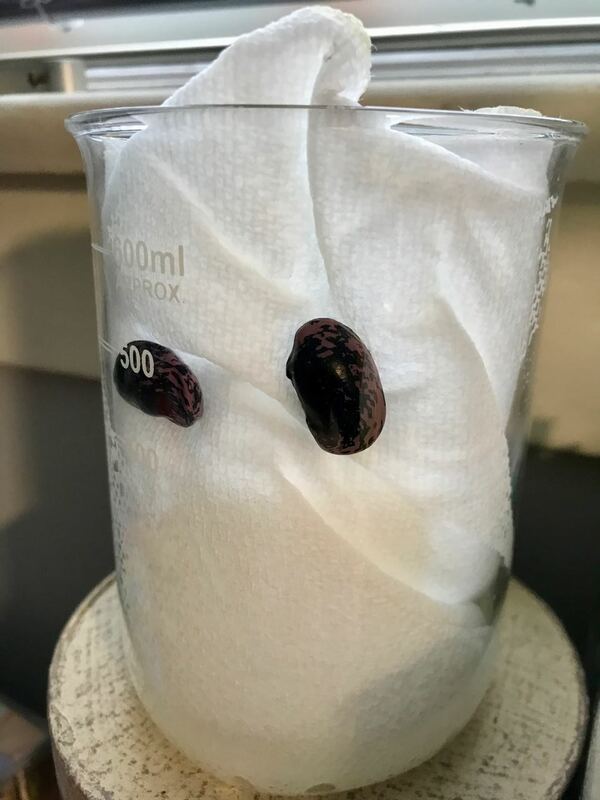 If you want to try the bean seed experiment, or try it again, this activity sheet from Kean University in New Jersey is a terrific primer. Let me know if you do. Wow, that was cool. I never thought of beans having a bellybutton! It was cool to do. You’d still have time before the soil heats sufficiently to plant beans outside, Jessica. Will you give the experiment a try? A similar experiment with corn kernels (when I was 4 years old) is where I learned to love gardening! These experiences stay with us. The simple magic still amazes me, each time I take the time to notice. Kate, that info sheet from Kean talks about corn kernels as well. I’ll have to try that, too, some day! No front yard veggies for Toronto? 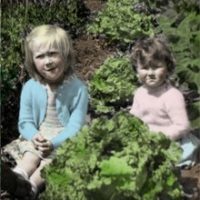 Trouble on the urban homestead: Is Canada safe?